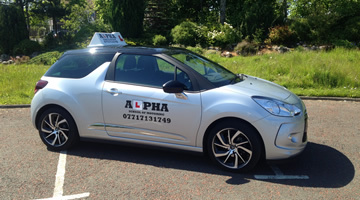 At ALPHA School Of Motoring it is our main aim to make you a safe driver for life. We are based in Peterlee, County Durham, however we cover many areas. If you would like to know whether we operate in your area please feel free to Contact Us. We offer a range of packages to satisfy all your needs whether you’re a complete novice or simply need a refresher course. My name is Stephen Scott, I am experienced and qualified to provide you with the excellent service you require. 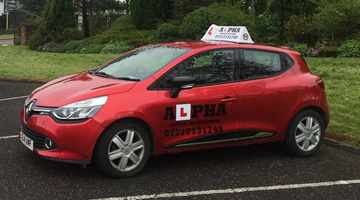 I count myself to be very lucky in life having had 15 years experience working in the engineering industry then taking an incredible decision to retrain as an Approved Driving Instructor (A.D.I). I found that it was more than just a new career choice. It was a unique opportunity to teach a life skill to so many people, and the feeling of accomplishment when they pass their driving test is second to none. It gives me great pleasure to see that smile on a pupil’s face as they receive their driving licence from the examiner. I trained as an A.D.I with BSM (British school of motoring) Once qualified I worked as a B.S.M instructor for over 4 years. After this time, and after many successful test passes, I decided it was time to leave and set-up my own driving school. I chose to call the driving school ALPHA (Being the first letter of the Greek alphabet. Alpha is often used in terms of "first", in other words "the best"). I thought this best described how I wanted my driving school to be presented and also how I want my pupils to feel. As the popularity of the services offered increased, it became apparent that I needed to get more cars on the road. I have now added extra Driving instructors to the business allowing us to give you more choice in what you need to get you through your driving test. We now have both male and female instructors which gives us more days and times to book you a lesson slot that suits your availability. When it comes to teaching I am a patient and very reliable instructor and I make it my main priority to ensure that all my pupil’s needs and requirements are met successfully. There is so much more to driving when you learn with a professional, qualified and experienced instructor. When you sign up with us you will have the use of a first-class vehicle that is used and trusted by many motoring schools and a prime choice for a first car. All of our vehicles are fully air conditioned and are fitted especially with HE-MAN dual controls ensuring that all lessons can be conducted safely in a relaxed and comfortable environment. These small but sturdy vehicles gives you complete control of the road offering comfort, ease of use and that little extra control when performing maneuvers. The DS3 offers a dynamic drive with its low driving position, body-hugging seats and flat-bottomed steering wheel. This is a versatile hatchback making it perfect for everyday driving and a perfect choice for learning to drive. The Clio Dynamique offers a comfortable and easy-to-handle drive. The interior is specially designed for first time drivers with logical controls making it easy to learn the essentials. Thanks a lot Steve, you are a great teacher and I couldn't of done it without you, I would recommend you to anyone.